This recipe was featured in Jenn Hall’s wonderful article about our project in Edible Philly. Of course, these notes always make me think about the recipes that circulate in my own community. 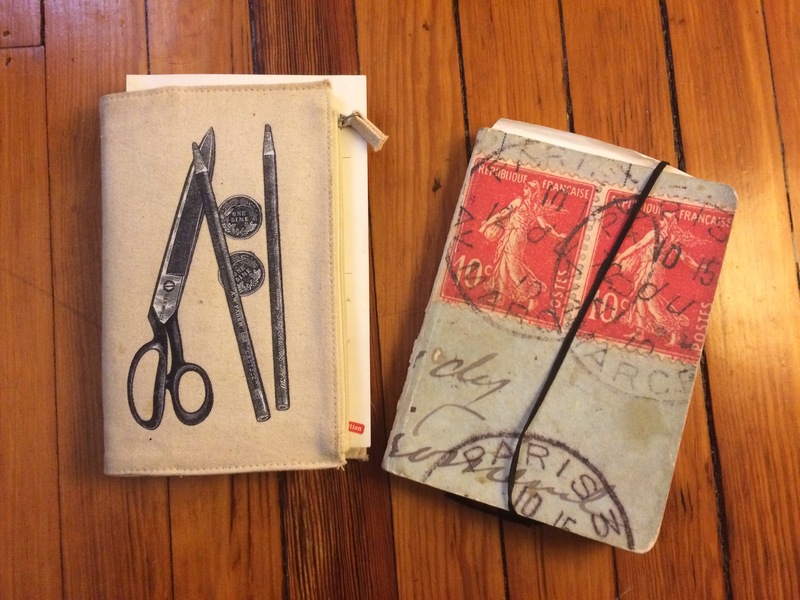 I keep my own handwritten recipe notebooks, too. I began to compile the first when I moved to London for a year and wanted to bring recipes with me. The notebook is full of recipes from my mother alongside dishes I’d cooked with friends and roommates in college. These books are part of a larger network of recipes in various material forms: my mother’s recipe box with cards in her handwriting, her mother’s handwriting, her sisters’ handwriting, and the handwriting of new and old friends; the letter I have from my great aunt with her cookie recipe in neat cursive; my notes from the afternoon I spent cooking eggplant parm with my father’s mother because I knew that I was missing crucial steps; printed emails sent from my husband’s family when he wanted to cook a dish from a home. My recipe book is full of attributions: Grandma N’s eggplant parm and my father’s insanely chocolatey variation on her spicy Christmas cookies, Jess’s curried lentils, Joseph’s scones, Grandma O’s soda bread (her mother’s recipe), Erin’s tortilla soup, my family’s favorite chocolate birthday cake, Ruth’s famous zucchini soup recipe that I first made with Bronnie, Rebecca’s salted orange cardamon syrup that I spoon into cocktails at parties, and last (but best represented in my notes) my Mom’s quick meatballs, herb biscuits, stews, zucchini bread, pumpkin pie, and more. This diverse community of women has fed me, sustained me, and taught me how to feed and sustain myself. I’ve started to collect recipes for mince pies and mincemeats, too. Thanks to my English spouse, Joseph, mince pies are (delightfully) part of my family Christmas now. And this is the second year I’ve added a historical version to the mix. (Here’s the 2015 recipe.) There are still more versions to try. Savory, rich, and delicious, these mince pies are a welcome variation on the classic British holiday treat. Ox (or beef) cheek is a wonderful braising cut and its inclusion here creates a rich, meaty base for the fruit, spices and rum. Make a batch of mincemeat and prepare fresh pies whenever you have guests coming over. They’re lovely hot from the oven with a nice cup of tea. The day before I made the mince pies, I whipped up a batch of my favorite pie crust from Orangette, used this recipe from Smitten Kitchen to candy orange and lemon peel, and loosely followed Jamie Oliver’s recipe for braised beef cheeks to cook the meat. Boy did my apartment smell good. Shred or chop the beef into small pieces. For an even mix, make sure these pieces are smaller than your raisins. Grate the suet on a box grater or in a food processor so it is also in small pieces. Combine the beef and the suet in a large mixing bowl. Mix in the currants, raisins, spices, salt, sugar, candied peel, rum and set aside. Roll out the pastry. Using a pastry cutter or drinking glass, cut circles. I used a 2 5/8 in (68 mm) pastry cutter to make nice little pies. Make sure you have an even number of circles so that you have bottoms and lids for all your pies. I used my handy mince pie pan to make a batch of 12. You can easily make mince pies on a baking sheet by shaping the top piece of pastry over a mound of mincemeat. I think the full amount of mince would make 4 dozen little pies (or even more). Grease your pan. Put 1 T mincemeat on/in each bottom. Place a lid on each pie. Push down the edges of the pastry to seal. Poke a few air-holes in the lid with with a fork. I brushed the top with an egg wash for a golden crust, but this step is optional. Bake mince pies for 10-15 minutes until golden brown. For a festive touch, sprinkle with powdered sugar before serving. With the perfect mix of sweet, spice, fat, and booze, these mince pies are a decadent holiday treat. What a lovely dish to inherit from a mother, a loved-one, a community, an archive. In search of something quick and festive, I made this recipe at my mom’s house, in between walks with the dogs. UPenn MS Codex 895 is signed “Ann M. Plowden, 1756” on the inside front cover; a page later in the book is dated 1844, and the whole thing is written in at least four hands. This is the first time we’ve cooked from this particular recipe book, and I look forward to returning to it. Mix all ingredients together in a bowl until fully incorporated. Form the gingerbread as you’d like. For small cookies, bake ~20 mins., until a deeper golden brown and dry to the touch. Cool on a wire rack. This made 20 small cookies. These are certainly ginger-y! The brandy is a tasty addition that I hadn’t encountered in gingerbread before. They’re dense and a little chewy, and have plenty of flavor. From the instruction to bake it on paper, I was expecting a cake that would bake on parchment in order to turn out more easily. This was more of a dough than a batter, though, and a crumbly one at that (because of my molasses mishap). I settled on patting them into flattened golf-ball-sized rounds, but I will try rolling it out next (with more molasses). When I’m not distracted by a pug wearing a jinglebell collar and the need to finish wrapping gifts, I might look into why these are “Newport” gingerbread. 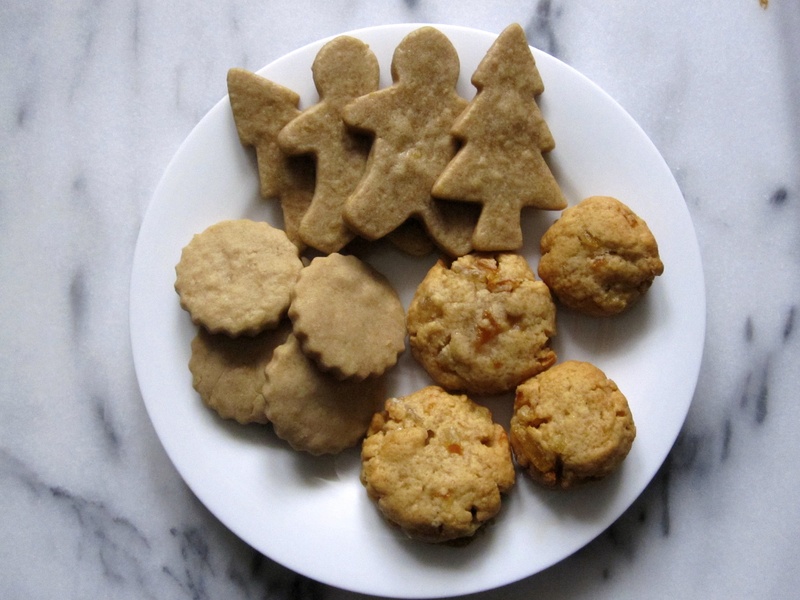 For now, they taste of ginger and the kitchen smelled festive and warm while they baked. That’s a good Christmas Eve eve cookie. Happy and peaceful holidays to you. We wrote a version of this post for the Folger Shakespeare Library’s research blog, The Collation. You can read it here. A special thank you to the Folger and everyone who came out to our Free Folger Friday lecture in December and got a sneak peak at these recipes. Dear readers, we finally found a chocolate recipe to share with you! Since we launched this project we’ve been looking for chocolate. Alyssa and I love chocolate, our friends and family who taste our recipes love chocolate, and we were pretty sure you would love a historical chocolate recipe, too. We knew hot chocolate or drinking chocolate existed in early modern England, but it took us a while to find a recipe. Chocolate was a luxury good and not necessarily something that would have been found in the households of the people who were writing the manuscripts we’re working with. Drinking chocolate finally became more affordable and widespread in the late seventeenth and eighteenth centuries. The Folger Shakespeare Library in Washington DC has a wide range of culinary manuscripts, and we’ve barely scratched the surface of their holdings. In October we participated in a Transcribathon sponsored by Early Modern Recipes Online Collective and the Early Modern Manuscripts Online Project. Reading through Rebeckah Winche‘s receipt book, Folger MS V.b.366, we found this recipe for “Chacolet.” As the coordinators of the Transcribation noted, the manuscript has a dated inscription, “Rebeckah Winche 1666,″ that conveniently locates the book in a seventeenth-century English household. The recipe for “Chacolet” describes the process making hot chocolate from whole cocoa beans. Europeans may have encountered cocoa beans, but many would also have encountered chocolate in processed cakes that resemble the final product of this recipe as Sarah Moss and Alexander Badenoch suggest in Chocolate: A Global History. Moss and Badenoch also remind us that our modern chocolate bars are still more than one hundred years away at the time that this recipe was copied down. Only in the nineteenth century did chocolatiers develop the modern machines and processes, like conching, that utterly transformed this rare bean into smooth, modern chocolate (57, 61). Our friends at The Recipes Project have also written some great posts about chocolate consumption. Amy Tigner has two posts about it here and here, and Amanda E. Herbert describes how she teaches with chocolate here. One interesting feature of this recipe is that it looks much more like a modern recipe than other recipes in Winche’s book or in the archive of historical recipes we’ve been exploring in general. Most of those are written as narrative paragraphs that combine measurements and instructions. This one looks more like what we’ve come to expect recipes to look like in the twentieth and twenty-first centuries: it begins with a list of ingredients with amounts – cocoa beans, cinnamon, Spanish pepper, sugar, vanilla, musk, and ambergris – and then includes a methods paragraph explaining what to do with these ingredients. Since the recipe’s formatting and instruction was somewhat familiar, our process of updating focused more on the ingredients. Now, it’s hard to find whole cocoa beans in their husks in a specialty grocery store, let alone a basic supermarket. At a health foods stand in Reading Terminal Market in Philadelphia Alyssa and I found cocoa nibs: dried and chopped pieces of cocoa beans. This form of chocolate is popular with bakers seeking to add crunch to chocolate chip cookies and raw foods enthusiasts looking for alternatives to processed chocolate. By grinding the cocoa nibs first by hand in a molcajete and then in a coffee grinder we often use for spices, I produced a hot cocoa mix with an even consistency. However, I decided to prepare Rebecca Winche’s “chacolet” two different ways: with cocoa nibs to get closer to the original cocoa beans and with cocoa powder, a pantry staple today. I also decided to leave out the rare, funky, and/or glandular musk and ambergris. Heat the cocoa nibs in a shallow pan for about two minutes. When they begin to look glossy, add the cinnamon and crushed red pepper and stir to combine. Remove from heat. Now it’s time to grind your cocoa nibs and spice mix. We started this process in a molcajete and then transferred the mixture to a coffee grinder that we also use for grinding spices. In the coffee grinder the mixture turned into a solid paste. A dedicated spice grinder or a small food processor would also do the trick. Return the cocoa and spice mix to the pan. Add the sugar and vanilla extract. Stir over a low heat for 2-4 minutes until the sugar is completely integrated and the mixture is uniform in color and texture. Some clumps will form, especially at the bottom of the pan. Transfer the cooled mixture into a jar and label with the date. Store in a cool, dry, dark place. Add all the ingredients to a shallow pan. Stir over a low heat for 2-4 minutes until the sugar is completely integrated and the mixture is uniform in color and texture. Some clumps will form, especially at the bottom of the pan. When I tasted the cocoa nibs version I was totally blown away. It was much spicier than I expected and had a nutty, chocolate taste. The oils and larger granules from the cocoa nibs gave the mixture a unique texture. The cocoa powder version had a more concentrated chocolate flavor. Despite the fact that both versions have the same amount of chili flakes, this one was less spicy. The texture was smooth and creamy. I could drink either of these on any cold day! The original recipe also made a curious suggestion: to wait three months before using the chocolate. Since I still had some of the cocoa nib mix in my cupboard a month after I first tested the recipe, I decided to test this point. The flavors had deepened and mellowed. The chocolate flavor in this cup of cocoa was deep and, in the whole, less spicy than the bath I made fresh. Feel free to store your hot cocoa mixes in a jar or plastic container in a cupboard for use throughout the winter and spring. Let us know if it changes over time! By making this recipe two ways I was first and foremost negotiating the realities of a modern kitchen – it’s a lot easier to take cocoa powder, that marvel of modern chocolate processing, down from the pantry shelf than to cocoa beans or even cocoa nibs. But despite the different starting points, the side-by-side taste testing of the two versions showed remarkable similarities– the mix of chocolate and warming spices is the real flavor-profile of the recipe and that remained consistent. When Alyssa and I cook in historical archives we’re often confronted by the possibilities and limits of how much of the past we can taste. Accessing these recipes gives us the opportunity to try dishes that early modern cooks tried centuries ago – not just to read about them, but to make them and savor them. We cannot duplicate their exact taste profile, but we can approximate it and do so in ways that make sense for our own modern kitchens. In the happy flurry of holiday baking and cooking, sometimes a simple recipe is welcome. I came across these preserved apples while on the hunt for gingerbread recipes in Catherine Cotton’s recipe book, UPenn Ms. Codex 214. 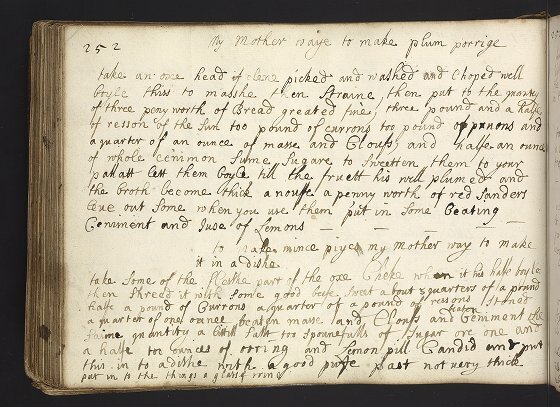 The recipe is in the same handwriting as those for ginger-bread and gengerbread that we experimented with – and really liked – here, so it probably dates to the late 1690s or early 1700s. All these “Pippins preserved at cristmas” require is a few apples, some sugar, a lemon, and water. Whether you make this simple dish or enjoy your own seasonal favorites, we hope you are having a lovely holiday season. Combine sugar and water in a med. saucepan and bring to a boil, cooking for 15 mins. Add apples and cook them at a steady boil, turning the apples occasionally. (They might want to boil over, so keep an eye on them.) Cook for about 45 mins., until apples are translucent and your kitchen smells delightful. Add the lemon juice and cook for another minute or two. Serve warm or refrigerate. These apples are not complicated to make – or to eat! I used up a few apples that were kicking around my crisper after the last round of applesauce, I think a macintosh and a fuji. Both fell apart a bit while cooking, which didn’t bother me, but if you’d like the apples to stay in their halves, a harder variety like a granny smith might work nicely. The end result tastes of very, very sweet apples, almost honey-like in their intensity. You probably wouldn’t polish off a large bowlful of these. (Which perhaps explains the relatively small yield of this recipe? Perhaps the preserved apples might have been used to flavor other dishes, or have been eaten sparingly on their own for a little taste of something sweet.) I topped them with my favorite maple yogurt to cut through some of the sweetness. With a cup of tea, they made a great breakfast for me and my sweet-tooth. And while we’re a few days past December 25, as Marissa reminded me, on Christmas day in 1662 Samuel Pepys’ wife was ill, so they celebrated with take-out mince pies and she started making her own “Christmas pies” the next day. Pull a Mrs. Pepys and make these “Pippins preserved at cristmas” well into January. I fell in love with mince pies in London on a cold December day. British winters are shockingly raw, wet, and dark to an American visitor accustomed to sharp, east coast wind and bright winter light. These sweet, spiced pies warmed me to my core. Traditional British holiday festivity is full of warmth and spice to combat the cold, the dark, and the damp. 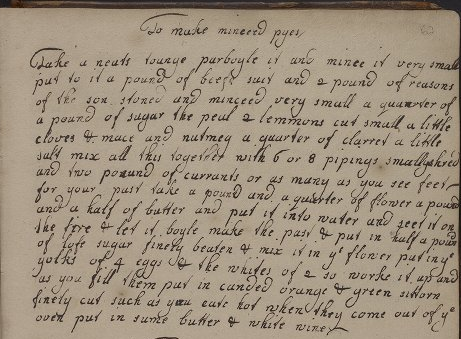 The mince pie that converted me was made by my spouse, Joseph, who also helped me prepare this recipe for “minceed pyes” from Ms. Codex 214, Catherine Cotton’s recipe book that also led us to three interesting gingerbread recipes. Although most mince pies today start with a base of raisins, currants, and occasionally apples and quinces, mince pies traditionally began with meat. The meat was flavored by these additional fruits, not the other way around. This recipe begins with a “neats tongue,” a calf or beef tongue. Gervase Markham’s starts with a leg of mutton. 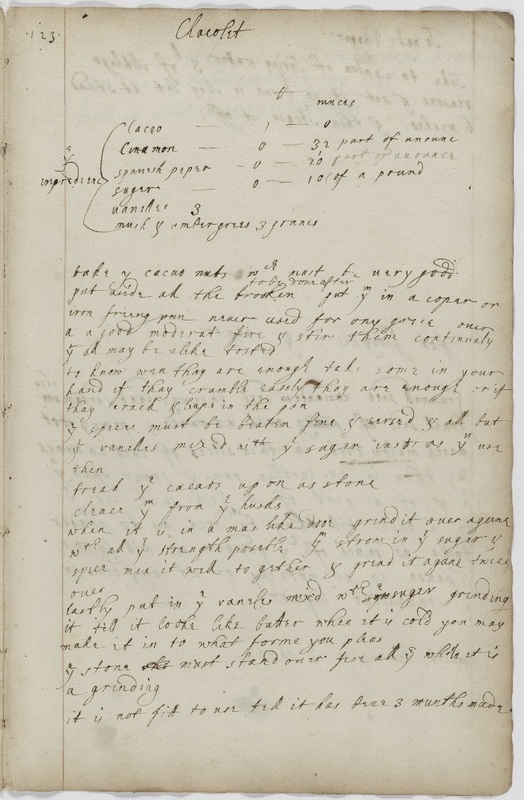 A mince pie recipe that I considered preparing from MS Codex 252 uses ox cheek. This nineteenth-century cookbook published in Boston even has a mince pie recipe that starts with tongue. I swallowed my reservations, took the trolley to Reading Terminal Market in Philly, and ordered a beef tongue from a butcher. The recipe begins with instructions for preparing a rich mincemeat: parboiled tongue, grated beef suet (or beef fat), raisins, sugar, lemon peel, pipings (or apples), and currants seasoned with clarret (red French wine from Bordeaux), cloves, mace, nutmeg, and salt. In many ways, this ingredient list is similar to modern recipes for mince pies — fruit, suet/fat, booze, spices, sugar, and citrus. But then there’s that tongue. Tongue is, of course, a staple of many cuisines, but I’d never prepared one before. Luckily Joseph has never balked at an offal challenge and helped me by brining and parboiling the tongue following Fergus Henderson’s recipe from Nose to Tail Eating. This process adds at least three days of brining and three and a half hours of slow boiling to the overall cooking time. Another food blogger has reconstructed the recipe with great photos of the method here. Once the mincemeat is ready, this recipe calls for an interesting method of pastry making and a final round of seasoning with candied orange and “sittorn” peels (lemon peel), butter, and white wine. Between the lengthy tongue preparations, ingredient sourcing, and making the candied peel, I decided to prepare my favorite pie crust from Orangette instead of trying out this pastry method as well. Although this was really born out of fatigue and convenience, there’s another more pressing reason, too: Early modern pie crusts weren’t always meant to be eaten. In many cases they simply served as a semi-edible container that would preserve meat and other ingredients during extended periods of storage. Ken Albala discusses this in a recent essay where he re-reads Hamlet’s famous statement that the baked meats from his father’s funeral were served at his mother’s wedding. Sure, Gertrude may have remarried quickly, but baked meat pies were designed for long storage all the same. The instruction to add butter and wine at the very end also tipped us off that this pastry might fundamentally be utilitarian because sealing meat pies with hot fat and alcohol was part of the preserving method. I’ve included an updated version of the pastry recipe below and I plan to revisit it in the future (pastry off? ), but we wanted you to have mince pies in time for Christmas! Our recipe is quartered from the original, but we’ve included the original amounts [in brackets] as they were given in the recipe. This is the full recipe. As we discussed above, we made our favorite pie crust from Orangette because of tongue fatigue. Mix together tongue, suet, raisins, currants, apples, spices, lemon zest, sugar, and claret and set aside. Right before you make the pies, add the candied peel, white wine, and butter. Put your flour in a bowl. Heat the butter and water in a small saucepan until it comes to a boil. Pour into the flour and stir until a dough forms. Add the sugar and eggs. Mix until your have a workable pastry. Roll out the pastry. Using a pastry cutter or drinking glass, cut circles. We used a 2 5/8 in (68 mm) pastry cutter to make nice little pies. Make sure you have an even number of circles so that you have bottoms and lids for all your pies. Place a lid on each pie. Push down the edges of the pastry to seal. Poke a few air-holes in the lid with with a fork. We brushed the top with an egg wash for a golden crust, but this step is optional. Bake mince pies for 10-15 minutes until golden brown. Sprinkle with powdered sugar to serve if you want these to look especially festive. This recipe made 25 mince pies with enough leftover mince meat to make another full batch. Next time, I’ll add more mace, cloves, and nutmeg. I might add the candied peel and white wine to the mincemeat from the beginning. On the other hand, I might leave out those last 2 T butter which felt extraneous. We also have a ton of leftover mincemeat in the fridge. I’m excited to see how the next batch tastes after the flavors marry for a bit longer. There’s a Christmas tree that needs trimming and there’s nothing like eating holiday baked goods and making the house merry. Alyssa and I would like to thank Joseph Malcomson for rising to the tongue challenge and helping us devise and prepare this recipe. Last week, Marissa and I were very pleased to give a talk on “Shakespeare’s Kitchen” at the Folger Shakespeare Library, part of its Free Folger Friday series. Good timing: the foundations of Shakespeare’s kitchen area at New Place in Stratford-upon-Avon were discovered by an archaeological team (!) just the week before. We cooked up a few new recipes for the event. Now, it’s been suggested that I might be a rabid fan of the Christmas season. I think I’m just enthusiastic. (Typed while looking at the decorated pine branches on my bookshelves [my version of a tree] and listening to Bing Crosby. Ok, fine. Very enthusiastic.) So, we decided to be seasonally festive with these recipes. Along with the (awesome) hot chocolate mix that Marissa will be sharing soon, we investigated early modern gingerbread. For the gingerbread mission, I turned to a new – to us – recipe book: UPenn Ms. Codex 214. Both the front and back covers are embossed with the original owner’s name, and the inscription includes a date, so we know that the book originally belonged to Catherine/Catharine Cotton and was compiled starting around 1698. We’ll definitely be revisiting this collection, which contains a range of appealing recipes – including the poached apples I have my eye on next. Cotton’s book turned out to be well-suited to this particular mission, as it contains three gingerbread recipes: one with honey and candied peel, one with brown sugar and milk, and one with treacle and caraway seeds. Gingerbread as a dessert began appearing in Europe around the fifteenth century, originally as a mixture of breadcrumbs held together with honey and ginger, then shaped using molds. At Queen Elizabeth I’s court, gingerbread was baked into the shape of people and decorated to look like visiting foreign dignitaries – the first gingerbread men! In the late seventeenth century, ginger would have been imported into England (most likely from Jamaica, the Spice Islands, or India) as the whole root, sometimes pickled. That Cotton’s book includes not one but three recipes for gingerbread indicates ginger’s availability and the treat’s popularity by 1698. To make good Gengerbread P.C. Combine sugar, butter, and milk in medium saucepan and cook over low heat, stirring frequently, just until butter is melted. Remove from heat. Add ginger, then stir in flour in two batches. To use immediately**: Scoop dough in tablespoon-sized balls. Flatten slightly with fingertips or bottom of a water glass. To roll out***: Pat dough into a disc, wrap in plastic, and refrigerate at least 2 hours or overnight. Roll to 1/4″ thickness on a floured board and cut out in shapes. Both methods: Bake at 350F for 12 mins., until bottoms are golden brown. (Tops will look slightly puffed but won’t take on much color.) Remove from baking sheet and cool on a wire rack. Makes ~2-3 dozen cookies. *I halved the recipe and ended up drowning in gingerbread cookies – over 50 of them! Quartering the recipe makes for a more reasonable yield, but it can easily be scaled back up if you’re in need of gingerbread for days. **The recipe implies that the dough can be used right away. However, I’d added enough flour that it was starting to taste bland and the dough was still fairly soft and sticky. I knew I wouldn’t be able to roll it out, so I scooped it into balls and experimented with flattening some of them. The flatter the discs, the better they baked – the scoops left round didn’t have the nice bite that the thinner cookies did. ***”Paste” can stand in for our modern “pastry” in these cookbooks, so it didn’t seem unlikely that the original could have been rolled and cut out. To manage this, I refrigerated the dough, which made it much easier to handle. In fact, it rolled and baked up beautifully – this is definitely my preferred method for this recipe. Combine flour, sugar, and honey in a large mixing bowl, using a spatula or (as I did) your hands. Add the peel and make sure it is evenly distributed through the mixture. The dough will be very crumbly. Using a scoop or soup spoon, take about 1.5 tbsp. of dough at a time and squeeze/pat it into a flattened ball. Bake cookies at 350F for 15-18 mins., until lightly browned and fragrant. 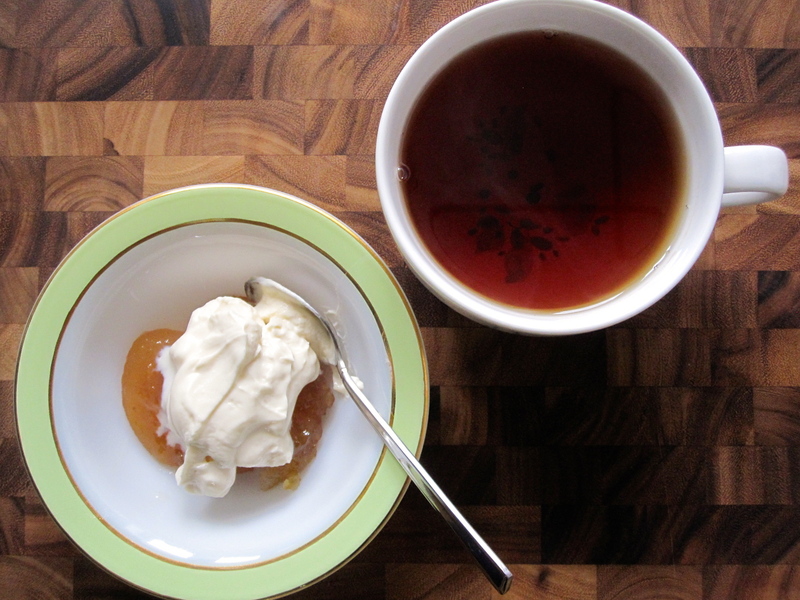 ****Candied peel is an ingredient we run into frequently in these early modern recipes. 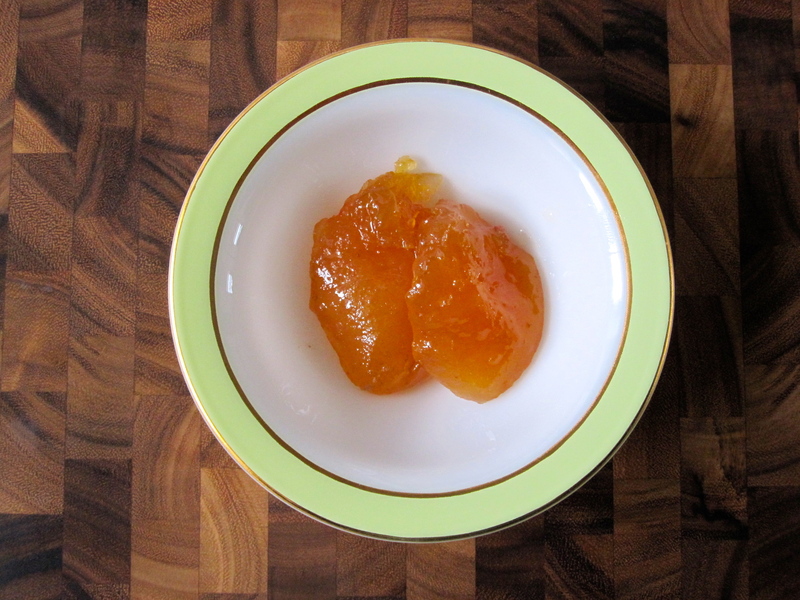 As we’ve discussed with some readers, candied peel is readily available in British supermarkets but not in most American ones, so we sometimes end up substituting zest to approximate the taste (if not texture) of the citrus peel. For the gingerbread, however, I wanted to see how the peel would work with the ginger and also thought the sticky peel might help these crumbly cookies hold together, so I made my own using this recipe. One winner, one respectable second-place finish! The “ginger-bread” gingerbread was surprisingly flavorful, given its short list of ingredients: there’s a LOT of sugar and butter and ginger in there, but they all meld well together, perhaps mellowed by the addition of milk, and these were neither overwhelmingly sweet nor too gingery. (I might even increase the ginger next time, maybe throw in 1/2 tsp. of powdered ginger to add some bite.) As noted above, I experimented with making these into balls, discs, and cut-out cookies. They all worked, but the cut-out cookies baked uniformly and had a good bite while retaining some softness. I’ll use this method from now on. The “Gengerbread” gingerbread turned out to be tasty toothbreakers. 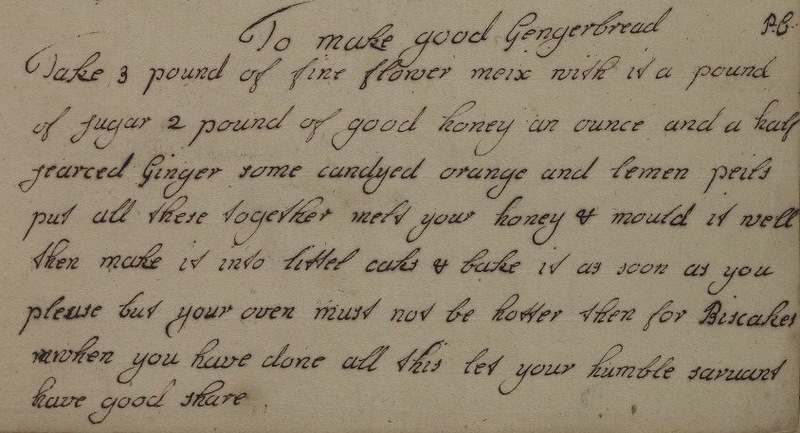 Because the original recipe suggests melting the honey, I’m guessing that honeycomb might have been used here, and that the wax would have helped as both a binding and softening agent. I didn’t have any honeycomb, but I did have an old(ish) jar of honey waiting to be used – good enough. I had to add slightly more honey than called for to get the dough to hold together. They were still fairly dry and VERY hard. (I made them in two sizes and found the smaller cookies even more difficult to bite into than the larger ones!) Some gnawing was require on the first day, though they softened over the next few days. (And, as was helpfully suggested at the Folger talk, you could put a slice of bread or apple in the container with them to speed this softening process.) I like the candied peel + ginger combination very much – in fact, you taste the honey and the citrus more than the ginger here, which is interesting. I probably won’t be making these exact cookies again because I’m not sure my teeth can handle it, but I might play with adding honey and/or candied peel to some other gingerbread recipes. Will I abandon the family gingerbread recipe that I make every year? Not a chance. But making these two recipes – I’ll report back on the third once I acquire some treacle – introduced me to some new gingerbread ideas and highlighted the variety available in just one recipe book. And the room to play with different techniques. In this project, not being given a specific method can nerve-wracking – particularly for someone who likes to follow very precise baking instructions. (See: me.) But it’s also liberating. There’s room for creativity, fun, and experimentation in the ambiguity. I’m looking forward to seeing what else is in Cotton’s book. Stay tuned.